Today's app is one of those useful tools you want to have on your iPhone just so it's there when you need it. It does pretty much one simple thing: it pixelates selected parts of a photo on your iPhone. Sometimes you may have a picture that you want to share online but it has bits of sensitive information that you want to hide. You don't want your license plate number posted online, sometimes you may want to blur out faces from a photo (we won't ask :), or just any personal information that you prefer to keep away from prying eyes. You can of course send the photo to a desktop computer and use a program like Photoshop to pixelate areas in your photo but that both takes a lot more time, and makes the process of taking a picture on your iPhone and just sharing it online, much more complicated. 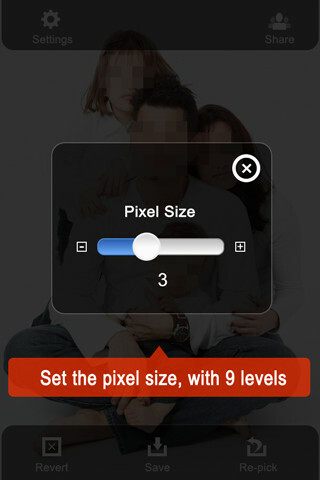 PixelateTool is a simple app that lets you pixelate specific parts of your photos and then easily share them online. You just take a picture, censor parts that you don't want exposed by dragging on top of them, and those area of your photo with be pixelated. 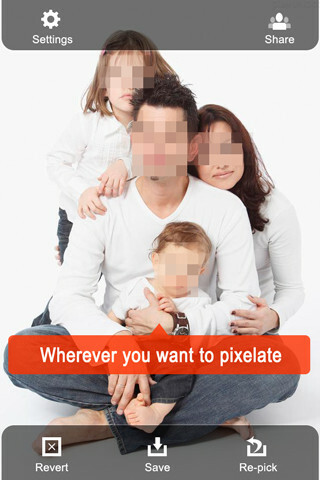 In addition Pixelate lets you choose what pixel size to use when creating your censored image and you can choose multiple parts of the photo that you want to blur out. When your image is ready Pixelate Tool will also let you easily share that photo online. Trust me, if you are concerned with your privacy but do enjoy sharing photos on Facebook/Twitter/etc... you'll want to have PixelateTool on your iPhone, waiting there ready for the moment you'll want to post a photo but don't want everything exposed online. The iPhone version is $1.99 in the AppStore and there is also an iPad version of PixelateTool.